The Tile & Grout King Inc.
New tile can dramatically change the look of your home or office. Whether you are installing new floor tiles, tile countertops, a tile shower, exterior tile, swimming pool tiles or any other type of tile project, professional tiling work is one home improvement project that can make a dramatic visual impact, as well as a significant improvement in value and functionality of your home or office. Tile is a durable finishing material that resists wear and is easy to keep clean. Tile is a great flooring alternative, especially for damp areas or areas that are frequently wet, such as entryways, mudrooms, kitchens and bathrooms. That’s because tile resists mold and does not expand or contract with changes in the weather like wood and other synthetic surfaces can. A good tile contractor that serves your area of Santa Clara County will be a great resource to help you get the best, most attractive tile for your budget and home. Make sure you choose a Santa Clara County tile contractor with the right experience to finish a project like the one you are taking on. There are many tile contractors that serve the major cities of San Jose, Morgan Hill, Campbell, Santa Clara, Sunnyvale, Mountain View, Gilroy and Milpitas, as well as all the smaller towns. The biggest question to answer now is how can you find the best tile contractor in Santa Clara County for you? Anyone can claim to be qualified to lay tile. But is that someone you want in your home, much less someone you want remodeling your home? Tile is a long-lasting feature, so you want to make sure it comes out looking – and functioning – perfectly. Some homeowners have a clear idea of what they want, and others are open to suggestions, but everyone needs a professional tilesetter who knows what they are doing, the ins and outs of tile installation. A little research on a company can tell you a lot. Hiring a Diamond Certified tile contractor is a smart move, as only the best professionals are certified by American Ratings Corporation. Everyone wants a perfect happy ending to their tile remodel project, but there are a few more things to consider. There are many different kinds of tile including porcelain, glass, terra-cotta, stone, travertine, marble and composite. Professional tile setters in Santa Clara County near you (be that San Jose, Palo Alto, Santa Clara, Sunnyvale, Mountain View, Gilroy, Milpitas, or a smaller town or rural area) can usually help you decide what kind of tile is best for your home, whether you’re planning indoor or outdoor tile installation. Some types of tile lend themselves perfectly to the specific use and feel of your room, while others may not be the best fit. Beyond the tile itself, good tiling contractors know the details of installation perfect for your setting. They will be sure to use the correct tools, grout and sealer for your newly tiled area. When your tile contractors know what they are doing, that takes all the pressure off of you. Even if you already have an idea in mind for your project, a true professional will be able to recommend small changes for better function, or to save on costs, even improving the design. 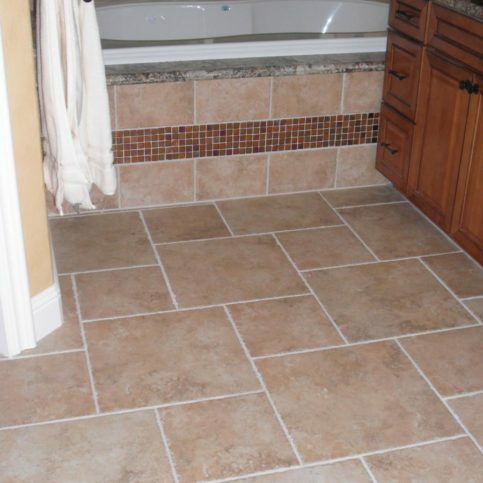 Do you want any special features incorporated into your tile job? Let the local tile contractors know the look you are going for early in the planning stages. It is also important answer the following questions: is this a rental property that you want to keep attractive yet simple? Or is this a home you want to live in for years to come? Do you want this room to look antiqued? Elegant? Sleek and modern? Inviting? Professional and no-nonsense? Dainty? Rustic? Glamorous? Once you know the answers to these questions, then decide how your new tile fit into this goal? Maybe your room is centered around a specific feature. Or there might be a certain aspect of the room that you would like to hide, or downplay. Let your tiling contractor know these things so that together you can create exactly the ambience you want. Keep any samples you like, including photos of other homes, magazine spreads, or color swatches to show and communicate your goals clearly. Ask the right questions, and you are a big step closer to finding the right fit for your tile project. Read on to find the best questions to ask, and empower your self as an informed Santa Clara County consumer. Why Trust Diamond Certified Tile Contractors Rated Highest in Quality? Hany Louis is COO and general manager of The Tile & Grout King Inc., a Diamond Certified company since 2011. He can be reached at (408) 622-0338 or by email. Outside of work, Hany enjoys participating in activities that combine recreation and exercise. “I’m not a fan of working out, simply because I don’t enjoy the repetitive nature of it, so I stay in shape by playing competitive sports like volleyball.” Additionally, Hany and his family enjoy going on winter snowboarding excursions at various Lake Tahoe resorts. A: The San Jose Sharks. A: Kenzo Sushi in South San Jose. A: I wrestled and played football. A: Cookies—I’m a legitimate cookie monster. Q: What was your favorite TV show when you were growing up? The Tile & Grout King designed and installed this public shower at a local gym. The Tile & Grout King installed this custom medallion in a hotel lobby. 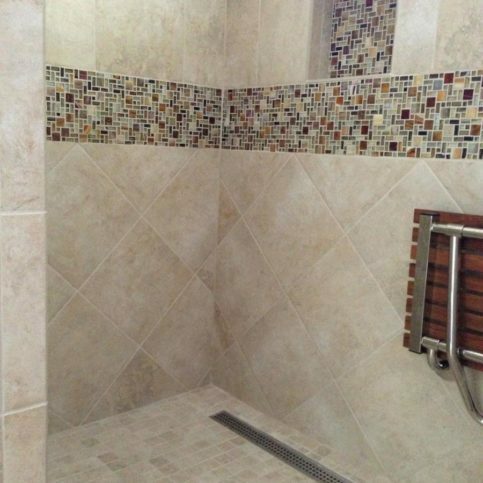 The Tile & Grout King installed this multi-sized tile floor with a matching tub accent mosaic. The Tile & Grout King installed this granite vanity top and floor tile. The Tile & Grout King installed this tile floor. The following links will take you to industry sites and consumer associations with even more information about choosing a tile contractor and tile setting professional. Before you begin calling local tile contractors in your area, there are a few things to ask yourself. First of all, what is your deciding issue in choosing a specific Santa Clara County tile company for your job? Is it important to you to have a Diamond Certified tile contractor whose work is backed by the Diamond Certified Guarantee? Are you in a hurry to get the job started or finished by a certain date? Is price a big factor in your decision? What about specific types or colors of specialty tiles or tile laying methods? It is important to have a general idea of what you plan to spend when you begin a project. A quality tile contractor will be clear about price before they begin the work. Knowing the answers to these questions can save you time and hassle down the road and can help you make wise decisions during the planning process. Do I want a Diamond Certified tile company that is rated best in quality and backed by the Diamond Certified Performance Guarantee? In which rooms or areas do I want new tile installed? When do I want this home tiling project started and/or completed? Are there any specific types of tile or tile colors or features I want? What is my budget for new tile installation services? If things went well in your phone conversations, invite a few of the best tile contractors visit your home or business to see the project site firsthand. No good tiling contractor can give you an accurate bid without viewing your home or business in detail. In fact, many tile contractors provide this service free of charge. This will give them a chance to accurately assess the current state of the room and see any items that will cause the job to be more complicated or expensive than expected. This on-site estimate protects their interests and yours. Who will be doing the doing the new tile installation? You, your employees, or other tile contractors? If you hire subcontractors, are they covered under your insurance plan or do I need to verify insurance and licensing separately? How many people would be visiting my property during the tile installation? What process do you use to select and train employees? Should I be present during the tile setting? Or can I leave my home or business in your care for the duration of the project? How long can I expect this tile installation to last? What start and finish dates can you propose? How long does a tiling project like this one usually take you? Do you charge extra travel fees for driving to my home or business location? What kind of mess can I expect during the tiling process, and where on my property can I expect it? How will you protect my home and property from unnecessary dust, damage or construction debris? Will I be able to live in my home while you are completing the project? If so, which areas will be off-limits to me and when? Now that you have seen my property and heard about my plans, what suggestions do you have for me? Does your price estimate include materials or do I pay for those separately? How sure are you of the quoted price? Have you factored in for extra time or broken tiles, etc? (If not, you may want to ask for an adjusted estimate that includes a worst-case scenario or extra line item for average unexpected expenses? Will you leave my job mid-way through to work on other jobs? If so, will this delay the finish time of my job? It’s best to choose Diamond Certified home tiling companies because all certified companies have passed an in-depth ratings process that most other tile contractors can’t pass. If you want quality from a tile setter in Santa Clara County and the greater Bay Area, you can have confidence choosing a Diamond Certified company. If you have found one or more local tile contractors who fit your needs, there is another smart step that may help you make your final decision. Ask the Santa Clara County tile contractors you’re considering for a list of references from their recent work. After all, who better to testify what it is like to work with the tile contractor under consideration than someone who has worked with them in a similar capacity as you’re planning? Of course each person has different needs, so some of the opinions and accounts you hear may not be applicable to you or may not take into account your expectations. But by listening carefully, you might uncover a red flag or a hidden jewel of data that helps you make a final decision on the best Santa Clara County tile company for you. 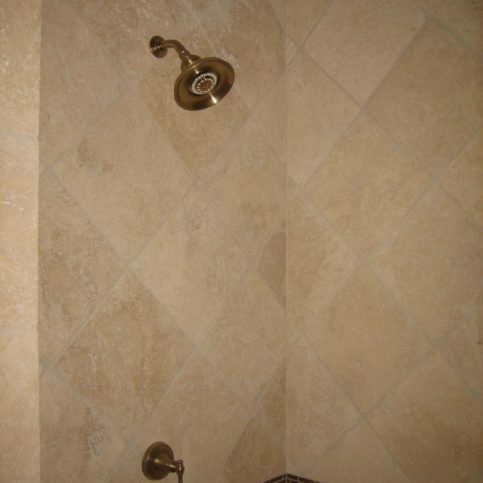 Were you satisfied with the work provided by this tile contractor? Did the tile setters complete the work within the timeline that they originally told you? Was the project over or under budget? If the project was over budget, why? Could anything have been done to prevent the unexpected expenses? Did this Santa Clara County tile contractor help you create a tiled room as good as better than you had originally imagined? What was the best thing about hiring this tile contractor? What was the worst thing about hiring this Santa Clara County tile contractor? Were you comfortable with the tile company employees who worked on your project? Did you feel like this company provided you with professional tile service? Would you recommend this tile contractor to friends or family members? Why or why not? By now, you should have a lot of quality information to work with. The great thing about contacting Diamond Certified tile contractors in your area, is that the most common concerns—those dealing with licensing, insurance and customer satisfaction—have already been eliminated. 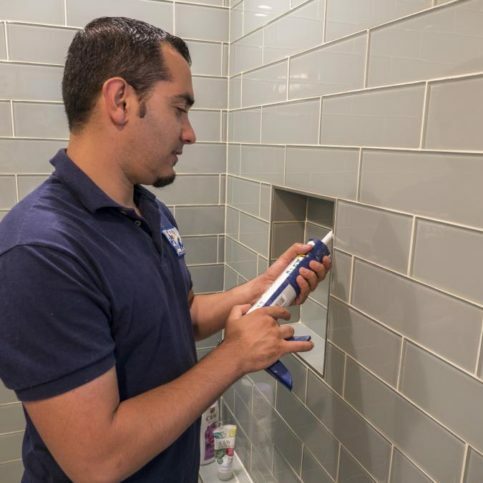 American Ratings Corporation has already screened each local tiling contractor stringently for up-to-date qualifications. These contractors have an excellent track record, as well as current certifications to legally complete your project. In the rare case of a problem, your tile project will be backed by the Diamond Certified Guarantee. The only thing you need to decide now is which local tiling contractor best aligns with your needs. Take a look at the notes you’ve taken while speaking with the contractor on the phone, and at the visit to your property, as well as comments from the references provided. A decision shouldn’t be hard to make. Take that step forward and choose your local tile contractor. During any tile installation process, it is important to work with your tile contractor as your partner. The tile contractor needs your input, and you need their expertise. Be very clear about your vision for the project. If you are having a countertop installed, be sure to discuss whether you want a tile backsplash installed as well, and what kind of detail you’ve imagined for the finished project. If a certain type of specialty tile, like Italian tile or pebble tile interests you, let your contractor know right away. They can discuss with you the pro’s and con’s of each type of tile in your particular environment. Collect samples to show your Santa Clara County tiling contractors – be they magazine photos, or sample tiles from your local hardware store. Certain types of embellishments could be difficult to install, so discuss that all before the project gets underway. You may also ask if your chosen tile contractor typically works with, or recommends a specific brand of tile. If so, which brand is it? And why do they recommend that brand? they should be able to answer your questions and prove to you that they have your best interests in mind. Once you know what kind of tile you’ll be working with, you should confirm the state of the property before the tile installation begins. Ask your tile contractor if they will do demolition of the existing area, of if you need to handle that another way. Also, will the local tile contractor you’re considering complete the basics, like installing drywall, greenboard or hardybacker in the space before they begin placing tile? Will they be able to provide all the finishing services you require after the new tile installation? Or will you need to hire another company to do these parts of the job? This is important because it can impact your happiness with the finished job, as well as your bottom line and schedule. Be sure you have a clear answer before you move forward by signing the contract. Just as you want to be treated with respect by any contractor you hire, Santa Clara County tile contractors hope for a pleasant experience when they come to work each day. Remember – your home is also your contractor’s workplace, if only for a few days. A good contractor will be very conscientious of your comfort and privacy. The following tips will help you be the kind of customer that encourages local tile layers in Santa Clara and the surrounding areas to excel at their job and provide good customer service. Be sure to arrive promptly for appointments or meetings with your Santa Clara County tile contractor. Provide your Santa Clara County tile contractor with all the contact information he will need, including the address of your property, and your daytime phone numbers, as well as anyone else he might need to contact such as a family member, additional contractor or insurance agent. Consider how the contractor and his team will access your property during the project. Make sure that someone will be there to let them in every time they come and go, or make sure that they have keys or codes to every necessary gate and door. If you are purchasing materials for the tiling project, have them ready and available. Many tile contractors are willing to purchase materials for you, which is one less step to worry about. Communicate your ideas and wishes clearly. Don’t make your tile contractor guess what it is you want. Once you have communicated your wishes, trust your tile contractor to carry the job through to completion in excellence. If you are available during the tile installation process, your Santa Clara County tile contractor should be willing to show you the progress at different points throughout the job. Ask all the questions you need, and assure that your tiling installation and repairs are progressing in the right direction. Observe carefully what is happening, and prevent any misunderstandings from causing a problem later on. The best tile contractors in Santa Clara County should also have an excellent track record for quality work and ideal customer service, which should simplify the job. After completion of your new tile floor, tile shower enclosure, tile countertop with backsplash, or other project, there will be time for a final inspection. Take a moment to enjoy your beautiful new tile addition. If there are any final comments or adjustments, now is the time to discuss them. Your Santa Clara County tile contractor wants you to be pleased with the finished product. Many tile companies in San Jose, Sunnyvale, Santa Clara, Mountain View, Milpitas, Piedmont, San Lorenzo or Palo Alto offer warranties on their tile work. But these warranties can differ widely. Does the warranty cover materials including tile, or just labor? Are there certain items that are exceptions to the warranty? How long does the warranty last on the new tile installation? Is there an additional cost for the warranty, or can you purchase an extended warranty for additional coverage? Does the warranty name the tile contractor as the responsible party? Or the manufacturer? How will you know which one is at fault or responsible for any problems or claims? Whatever the details of the new tile installation warranty, make sure that you get a copy of it, and file it in a safe place. Also, make sure you know who to contact, and how to contact them if there is ever a need for you to make a warranty claim. There are very basic, creative ways to use simple subway tiles to complete your signature effect. Subway tiles are the traditional white, glazed ceramic tiles found on the walls of New York City subway stations in the early 1900s. Most are three inches by six inches, and laid in an offsetting pattern. However, almost any rectangular tile can be referred to as Subway Tile. Beautiful granite tile is always a high class option for your home or office. The distinct look and classy polished feel of granite set your space a step above the rest. Many opt for granite in high-impact areas like entryways, showcase rooms, and open kitchens. You’ll definitely want a qualified contractor to complete your granite work, and give this luxury-worthy substance the quality setting and careful design that it deserves. A backsplash is an area of tile about a sink or countertop that lines the wall to protect that vulnerable area from splashing liquids or other matter. Apart from adding a very practical benefit, a quality tile backsplash can provide an amazing transformation to the look and feel of your room. The huge variety of tile patterns and textures is nearly unlimited. Mosiac tiles and specialty designs are often used in backsplash designs. In particular the spaces above a kitchen stove, sink or bathtub are wonderful areas to feature an artful tile design. Ask your Santa Clara County tile installers for suggestions to add a special touch to your room. Glass tiles can be large or small, tinted, opaque, iridescent, smooth or rough. Some glass tiles available from Santa Clara County tile setters are even formed from recycled glass. Glass tile provides an unmistakeable and unique look with depth. Glass tile can add something special to your design, be it a tile walkway, a special border accent, a backsplash, an entire room, or a tiled swimming pool. Good tile contractors in San Jose, Santa Clara, Livermore, Sunnyvale, Mountain View, Milpitas or your area can provide a professional opinion, a variety of inspirational examples, and the quality expertise you can count on to create an exceptional tile design in your home or work environment. Tile designs incorporate the ambience you choose for your area by utilizing the perfect combination of color, texture, placement and artistry. A tile mosaic may be premade and placed by an expert tile craftsman, or could be something formed specifically for you by a talented tile artist. A tiled shower enclosure is the way to go. Tile is durable and water proof, but in addition allows you to choose a distinguished look for this important space. 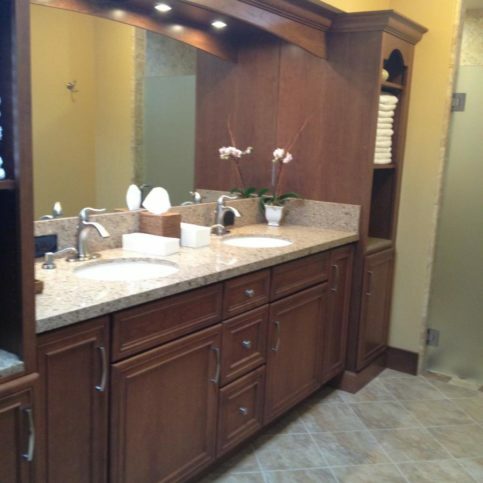 Tile in the bathroom can include floors, countertops, room dividers, walls, shower walls or any other surface. Installing tile in your kitchen is an obvious choice. What better surface to beautify your home while protecting surfaces from the wear and tear of a moist environment with fluctuating temperatures? Quality tile will repel moisture, keeping spills easy to clean, as well as protecting from steam condensation. Classic tile installations for Santa Clara County kitchens includes tile floors, tile counters, tile backsplash, and tiled kitchen islands. Tile is the perfect solution, easily personalized for any kitchen environment. Tile is also a great medium for outdoor landscaping projects. Beautiful Santa Clara County has many gorgeous examples of using tile to beautify an outdoor space, and increase its utility. Tile walkways, stepping stones, trails, bench blocks, fountains, pools, and patios are all excellent examples of how tile can create something wonderful outside. Tile floors are long-lasting, attractive and easy to clean. 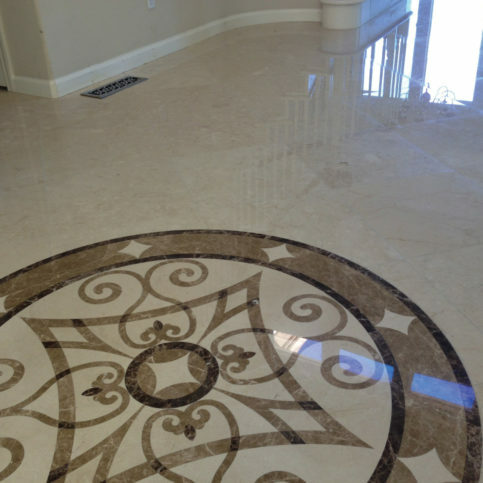 It is no wonder that tile flooring is one of the top requested tile installation projects. Tile is especially popular for hallways, entryways, bathroom and kitchen floors. When choosing tile for flooring you’ll need to consider how much traffic might pass through that area. Porcelain and ceramic tile manufacturers rate tile from Class 1 to Class 5 for durability. Class five is the most resilient tile. Natural stone tiles do not come with this rating system. Another factor to consider with flooring is how slippery it might be – particularly in areas with lots of moisture. In general, it is best to choose a matte tile over glossy for flooring in bathrooms, kitchen and entryways. 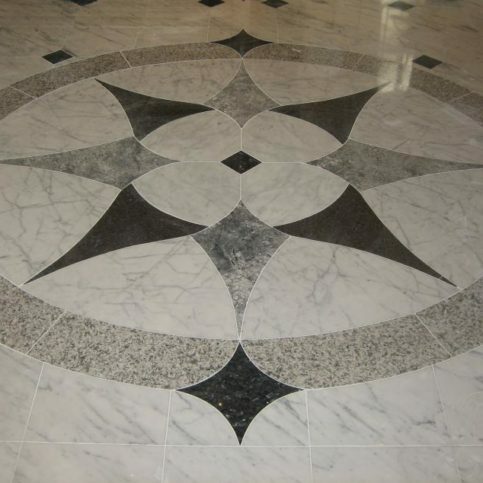 However, ultra-smooth tiles such as marble are often chosen for flooring despite the danger of slipping. 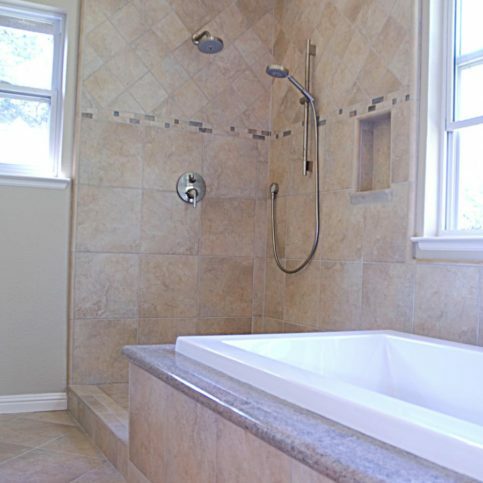 Your Santa Clara County tile contractor can assist you with such decisions if you like. Tile provides an affordable, durable hard surface for kitchen, bathroom or workroom countertops. It is also easily molded into the perfect shape for irregular islands or specialty additions. Use a diamond certified tile contractor to help you create a totally unique look that works perfectly. Treatment to the face of a stone to achieve a distressed texture or finish. Tile adhesive is an adhesive substance used to bond tile to a surface. The wall area located between the countertop and upper cabinets is known as a backsplash. Backsplashes in kitchens and bathrooms are often made of tile or decorative tile sheets to prevent water from damaging the wall. The proper positioning of adjacent floor slabs, or tiles, by their predominant color. A strip of tile with contrasting design, texture or color is known as a border. A specialty finish from treating the stone surface with a coarse wire rotary brush. A trim tile with a convex radius or finished edge on one side. Slathering a bond coat of thinset to the back of a tile immediately before the tile is installed. Helps ensure a level surface. A soft, water resistant material used for sealing. A trim connecting tile with one edge a concave radius. Decorative tiles are any tile with decorations or designs on the surface. Epoxy tile adhesive is a two part adhesive system used for bonding ceramic tile or stone to backing material. Epoxy grout is a two–part grout system used to fill joints between tiles. Stain and chemical resistant epoxy grout is a popular choice. Field tile is the primary type of tile used to cover a wall or floor. A popular method of aligning mortar using a straightedge is known as ‘floating’. Floor tiles are a tiles of any material durable enough to withstand traffic, pressure and abrasion. Vitreous tile that absorbs .5% to 3% is considered frost-resistant tile. Frost proof tile is tile that is impervious to water or that absorbs 0% to 0.5%. This type of tile is recommended for outdoor use in areas where the temperature ever falls near or below freezing. Tile grout is a material used to fill the joints between tiles. It may be made of silica sand, cement and a chemical mix. Tile grout is available in many colors. Glazed tiles are those with a finish of gaseous ceramic materials fused to the surface of the tile. Impervious tile has a water absorption of 0.5% or less and is therefore considered impervious to water. Limestone is a sedimentary stone that can have fossils or shells embedded in it. Limestone tiles are softer than other types of natural stone tiles and usually have a matte finish. A decorative tile border, primarily for walls. Marble tiles are made of marble, a natural stone product with a distinctive polished shine. Marble tiles add a rich, luxurious look to any room. Tile mastic is a ready to use organic glue used for holding tiles in place. This is a method of producing tile by a single firing in which the tile body and glazes are fired in kilns at temperatures over 2000 degrees. Tile designs mounted on mesh and cemented in place are known as mosaics. Many shapes and designs available with any type of tile including glass, ceramic, metal, porcelain and stone. “Mud” is the slang term referring to thick mortar made of sand and cement. Porcelain tiles are harder and more durable than ceramic tile due to the ingredients and higher firing temperature. Porcelain tiles have very low water absorption and are quite stain resistant. Tile sealant is applied to prevent the absorption of liquids into tiles. Sealant is used with porous materials like quarry tile, grout, and natural stone. Sealer is not necessary for glazed ceramic tile. Slate tiles are made of a natural material with colors ranging from grey to purple to black. Slate tiles are popular for use outside and inside. Tile spacers are small plastic pieces that are used in installation to evenly separate tile. Tile spacers are manufactured in various thicknesses and shapes to accommodate different tile designs. Substrate is the underlayment for the ceramic tile installation. Different types of tiles require various substrates to support the tile body. The bond coat in a thin bed installation is known as ‘thin-set’. It is made of sand, cement and usually a latex additive. Similar in composition to limestone but with holes created by hot springs, travertine is a popular type of natural stone tile. Travertine tile colors include beige, red, yellow and brown, with some variation from piece to piece. Tumbled tiles are created with a specialty finish. This finish is created with a tumbling machine or acid, which wears down the natural surface of stone tiles for a unique appearance. Vitreous tile has water absorption of more than 0.5%, but not more than 3%. Glazed tile with a body suitable for interior use is often called ‘wall tile’. Not expected to withstand excessive impact or be subject to freezing/thawing conditions, wall tile is also not is not appropriate for use on a floor. Q: Why should I choose a Diamond Certified Tile Contractor? A: Diamond Certified tile contractors are backed by the Diamond Certified Performance Guarantee. Only local tile contractors who have proved their quality work and superior customer service through an in-depth rating process earn Diamond Certified. Q: What rights to I have as a customer of a Diamond Certified tile contractor? A:Customers of Diamond Certified tile contractors have the right to receive a written estimate of services before the project begins. The Diamond Certified Guarantee ensures that all aspects of the original contract be met, as well as complete customer satisfaction. The work is already done for you to hand pick the best of the best contractors who have a well deserved reputation for excellence and customer service. If anything goes awry, American Ratings Corporation is there to back up the work to your satisfaction. Q: Is it really important to choose a certified contractor to complete my tile project? A: Tile installation is a labor intensive process. Once it is completed, it is a semi-permanent renovation that will add value to your home or property. Fixing a bad tile job usually requires everything to be torn out and completely redone. So you want your tile work done right the first time. Hiring an unlicensed contractor, or an unknown tile guy means you have no legal way to ensure that any mistakes will be remedied should they occur. It could be an expensive lesson. Q: How long will my tile installation take to complete? A: The time it takes to complete your tile installation project depends upon several factors including the size of the area to tile, if it is ready to begin working, and what kind of materials and designs you will include. Adding decorative designs or special features will take longer than just covering the surface with a single color tile. In general, tile jobs take from a couple days to a couple of weeks depending on the scope of work and availability of the contractor’s crew. Be sure to ask your tile company representative for an estimate of work completion before they begin. You can request to make this timeline part of your written contract. Q: How will tiling my property affect the value of my property? A: A quality tile job can make a huge positive difference in the value of your home on the resale market. Home buyers notoriously prefer upgraded kitchens in particular. A special feature like a beautiful fountain in a tiled patio, artfully tiled pool area, or a uniquely tiled bathroom may be just the feature that captures the heart, and the pocketbook of your buyer. Tile is more durable, and more customizable than many other common surface covers like linoleum, vinyl or formica. Tile installation is as much an art as a trade. The right artist can work a miracle in your home.